I hope you are enjoying #MexicanRecipes week as much as I am. I just love all of the inspiration! Since we started off the week with a side dish, I thought we better do a main dish as well. Of course I love just about anything wrapped in a tortilla, but I figured with all of the carbs in the Mexican Street Corn Barley Salad I should probably take it easy on the entree. Besides, it's grilling season and we better take advantage while the getting is good! So I decided to riff on one of my favorite Mexican inspired dinners, tequila lime chicken. In reality it's probably quite a bit different than what I've had out, starting with the yogurt. We just love how tender and juicy yogurt seems to make grilled chicken. In fact the Lemon and Yogurt Marinated Grilled Chicken is one of our go to dinners. So I couldn't help but to stir some in here too. Otherwise it's a lot of what you might expect. Of course there's tequila and lime otherwise the name would just be awkward. I also added some lemon to up the citrus punch and jalapeno to make it interesting. Of course we were licking our fingers between bites of this goodness! We tend to like to grill drumsticks or thighs as we find them more succulent, but of course it would be good on chicken breasts as well. Now I'm dying to know what your favorite Mexican inspired dishes are! Mix together all of the marinade ingredients. Pour marinade into a large zip top bag or container.Add chicken pieces and marinate for at least 4 hours or overnight.Discard marinade and grill over indirect heat until the center reaches 165 F on an instant read thermometer. Allow to rest for a few minutes and then serve. Let’s have a fiesta of Cinco de Mayo inspired recipes all week long! Check back each and every day for new recipes by following along with the hashtag #MexicanRecipes on social media. Are you a food blogger interested in posting within our blogging community? Find out more by joining us online: Holiday Fun with Our Blog Friends. Gimmie all the tequila and lime, well, not all the tequila but on chicken...YES!!! (I threw up drinking tequila in college...never again, lol) But in a marinade, yes please and my oldest LOVES chicken legs!! I would love one of these drumsticks with a side of that wonderful salad you shared. Thanks, Wendy! We really enjoyed the two together. I actually chopped the leftover chicken and stirred it into the corn salad and brought it to work for lunch the next few days. That was really good too! I am having so much fun revisiting your posts. Thanks for hosting the link up Carlee. Chicken legs and thighs are my favorite in the grill, too. The weather is forecast to be unseasonably warm here at the end of this week, so these may just make an appearance her. Thanks Carlee! Yay!! We are just getting through another cold snap but this weekend is supposed to be better. There is nothing like breaking out the grill and enjoying some good weather after a batch of yucky weather. I hope you enjoy it! 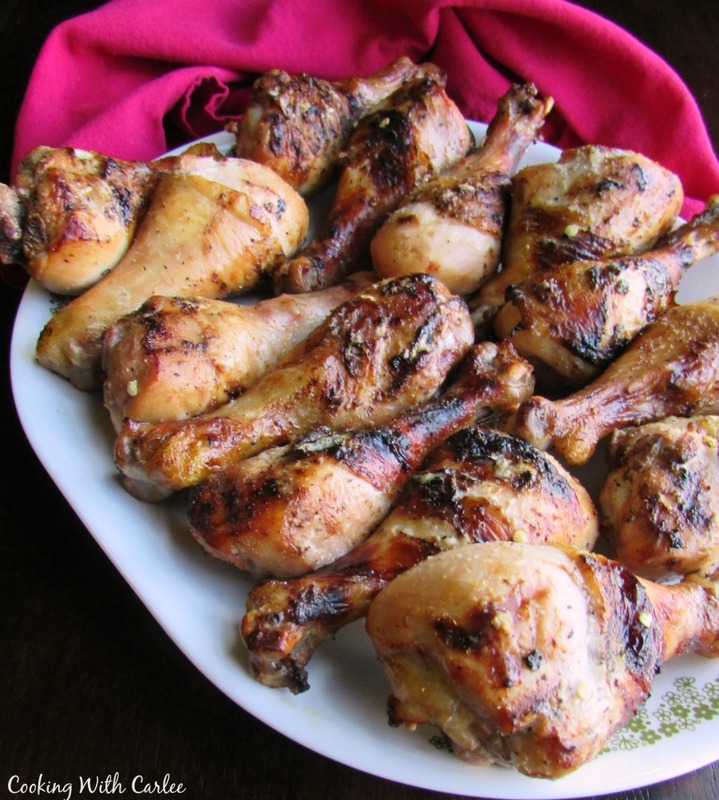 Grilled chicken is always a favorite and this marinade sounds great! Thanks, Caroline! It is amazing how much flavor the marinade can leave behind. Oh!! I'm all in in, I just love this recipe and can't wait to try it Carlee. I hope you enjoy it, Sam! We certainly did! Years ago I used to buy these at Sam's Club until I got a bad batch and gave up on them. Thank you so much for the recipe and I look forward to trying them. Oooh, a bad batch can definitely ruin a good thing in a jiffy. I hope you enjoy this version! I"ll have to substiture something else for the tequila.. but it looks scrumptious! You could probably go without, it wouldn't have that little zip, but the lime, yogurt, garlic and chili would still be lovely I'd think! 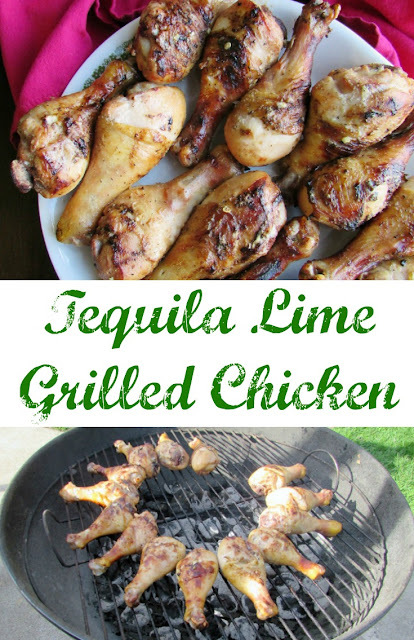 Tequila lime chicken sounds delicious! My husband loves thighs and legs too. 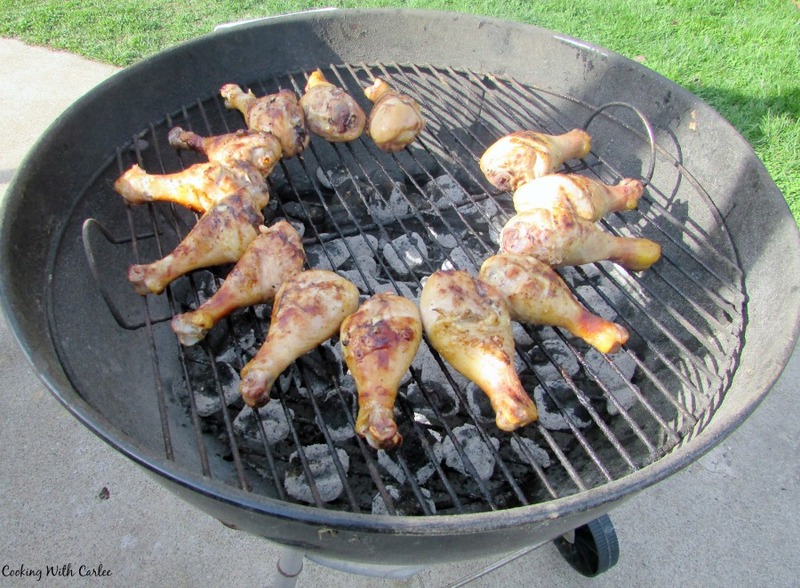 We love grilling them, they are so juicy and delicious! Not to mention affordable and fun to eat! I made something similar once before and had such high hopes for it, but the recipe completely fell flat. I think I'm going to try again using your recipe, because it sounds too good not to turn out well, lol! It's always sad when things don't work out the way you envision them! I just built on something we've had multiple times and enjoyed and changed it up with the flavors I wanted this time. Luckily it worked! This looks DELISH! I love Mexican food in just about any form it takes--always with extra lime! I'm so excited for Cinco de Mayo now! Thanks, Kelsie! I love the extra squeeze of lime too! Have a great Cinco de Mayo! Can't wait to try this on some bone-in chicken breasts! It would be great on chicken breasts. You'll have to let me know what you think! Hi Carlee, chicken marinaded in tequila? If that doesn't sound Mexican I don't what does! Unfortunately just the thought of tequila makes my stomach turn. The rest of the ingredients sound great though. I do fancy the lemon and yogurt marinaded chicken, off to check that out. I think tequila does that to a lot of people! I have never been a huge tequila drinker, but I do like it in this marinade and I enjoy about 4 margaritas a year. The lemon and yogurt chicken is still one of our favorites! Time to buy some tequila! Ole! That sounds like a heck of a plan! This recipe will sure be on our grill very soon! Hope you are having a great day and thanks so much for sharing with us at Full Plate Thursday! I hope you love it! Thanks, Miz Helen! I am so glad you linked this up at Celebtate 365 Blog Party, it's 1/2 way through summer, and I need new inspiration! Me too! I seem to hit a rut when the temperatures get this hot! 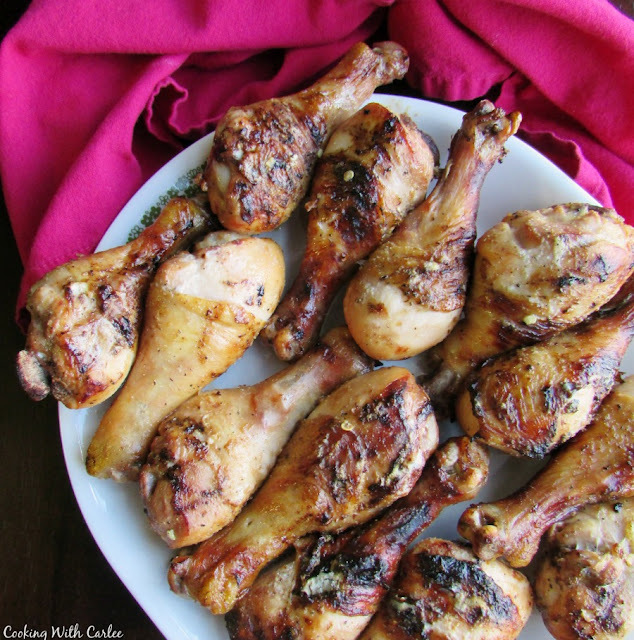 Perfect for our Grilled Recipe Round up ! Thanks for sharing ! These look delicious! I can't wait to try these soon! I loved this recipe so much I included it in my #Celebrate365 Grilling Bucket List: https://www.cornbeanspigskids.com/2018/06/grilling-bucket-list.html. Thanks again for linking it up!